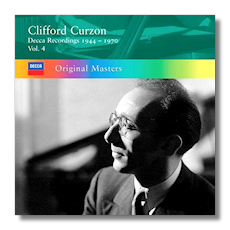 This fourth volume of Decca's Original Masters series dedicated to Clifford Curzon brings to an end this estimable series dedicated to one of the greatest pianists to live in the last century. One cannot really praise this collection too highly and the recordings which are of the highest standard imaginable truly enshrine what is one of the legends of the gramophone. The first disc features Beethoven's 4th and "Emperor" piano concertos in big boned recordings with Hans Knappertsbusch conducting the Vienna Philharmonic Orchestra. Next is the famous Brahms First Piano Concerto with the London Symphony conducted by George Szell whilst there also some entertaining 'Liebeslieder Walzer' with Imgard Seefried and Kathleen Ferrier from the 1952 Edinburgh Festival. The next two discs feature some interesting chamber music including Schumann's "Carnaval" and Schubert's "Wanderer" Fantasie in mono recordings dating from 1949 and 1954. The legendary 1957 recording of Schubert's "Trout" is also quite magical in this re-incarnation with some magnificent playing by the Vienna Octet, peerless performers in this genre. Some interesting rarities are also presented in the form of two pre war recordings of Britten's Mazurka Elegaica and Introduction and Allegro Burlesca with the composer himself accompanying Curzon. The short Pijper symphony is also an interesting rarity which deserves greater recognition. Finally we have six piano concertos by Mozart on three CDs which have all been reissued before on the now defunct Decca Legends series (see my review of these works on this website). Nothing more needs to be said except that all who do not have these recordings in their collections would do well to snap them up.